The equestrian statue of Emperor Domitian (lat. : equus Domitiani) is normally understood as a significant testimony of the new absolute claim to power which the last Emperor of the Flavian dynasty wished to convey. This absolute claim probably also constituted the reason why his Imperial rule failed. The colossal equestrian statue stood in the middle of the open Forum space. This specific location was a novelty, because the preceding generals and Emperors had their equestrian statues erected either at the Rostra at the Comitium or later at the Rostra Augusti. However, an equestrian statue, which was erected in the middle of the Forum, dominated the entire area and exhibited a new dimension of Imperial representation on the Forum. One should raise the question whether this choice of location did not result from the independent practice of trying to outperform one’s predecessors by erecting more impressive honorary statues on the Forum. On this view the positioning of the equestrian statue does not have to be interpreted as a result of Domitian’s exaggerated claim to power. In celebration of his victories over the Germanic peoples in 83/85 A.D. the Senate and the Roman populus honoured Domitian with an equestrian statue (this historical context can be inferred from the iconography of the statue, see below). Being awarded an equestrian statue was regarded as the most prominent form of receiving an honorary statue in Rome; the exclusive location amplified the prominence of this honour. Before Domitian the Rostra was the most exclusive space for the erection of equestrian statues (see Republican Rostra & Rostra Augusti): This is where the equestrian statues of Sulla and Pompey as well as of Caesar and Augustus stood. However, this tradition was broken by Nero, who granted a senator the honour of having his equestrian statue built on the Rostra Augusti. From that time on this location was no longer exclusively reserved for Imperial representation – and it was only a matter of time until new options were presented to the Roman Emperor for a more exclusive site for his honorary statues. The fact that Domitian chose such a solution, by having his equestrian statue erected in the middle of the open Forum area, gives us an understanding of Domitian’s ambitious conception of his own rule – however, at the same time this can be seen as the product of a dynamic process which had brought about many of the changes to the different representational forms since the late Republic. The practice of erecting honorary monuments in the middle of the square had already been realised prominently by Caesar and Augustus on the Forum Julium / Forum Augustum and can be seen as a relatively exclusive practice, which emphatically underlined the claim that was laid to the respective space by the person honoured. In the cases of the fora that were financed and built by Caesar and Augustus themselves this entitlement to the surrounding area seemed reasonable. Against this background, however, the erection of Domitian’s equestrian statue in the middle of the Forum, a space which belonged to all Romans, must have been perceived as an act of hubris. Nevertheless, Domitian’s construction project was less innovative and presumptuous as it first might seem. Already under the rule of Augustus the middle of the open Forum area had been occupied by three Columnae rostratae (honorary columns decorated with naval rams), which had been erected in honour of Octavian’s victory at Actium in 31 B.C. These columns stood there until Domitian’s equestrian statue was erected, which prompted these columns to be relocated to the Capitoline Hill. 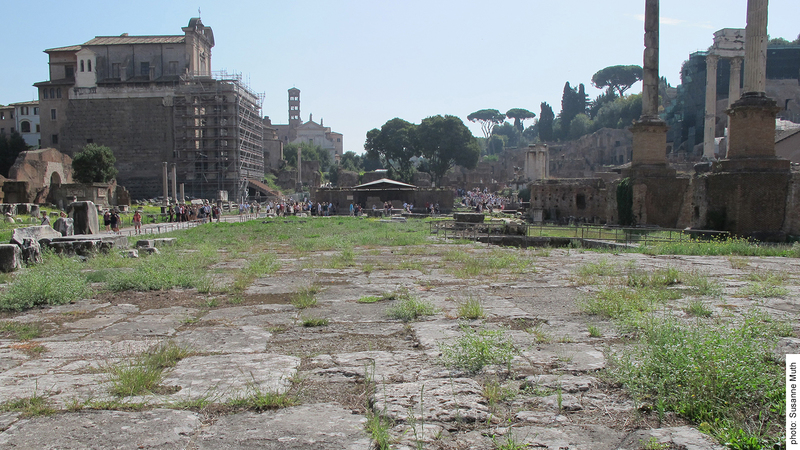 By building in the middle of the open Forum area, Domitian followed the example of Augustus, although he thereby replaced Augustus’ monuments with his own. 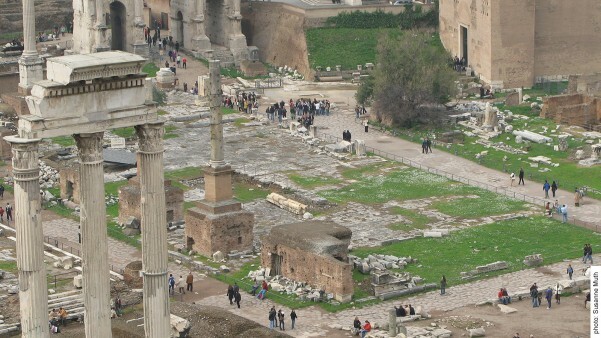 After Domitian was murdered in 96 A.D. and the Damnatio memoriae decided, which was supposed to eradicate any memory of the Flavians, the fate of the equestrian statue on the Forum was sealed: It was torn down and the traces of the former monument were wiped out, because the Forum area was newly paved. 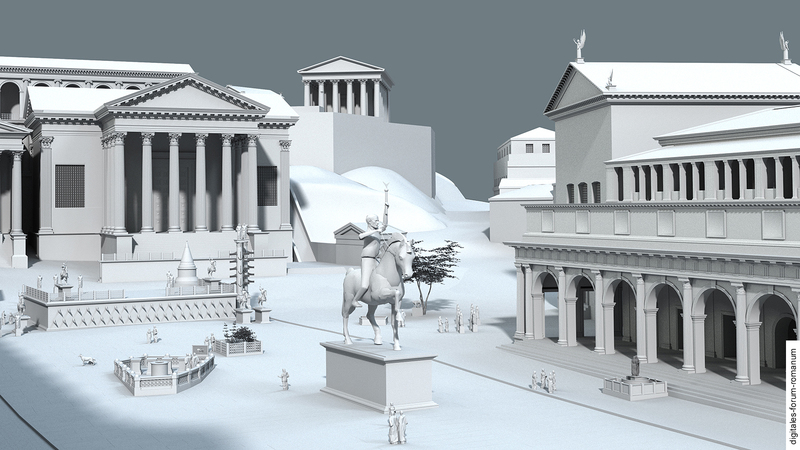 The location of the equestrian statue of Domitian can be determined by combining literary and archaeological evidence. The poet Statius praises the equestrian statue in one of his poems (silvae 1,1) and describes its location on the Forum: It nearly occupied the entire Forum; it was orientated towards the Temple of Caesar; the Basilica Paulli and the Basilica Julia stood next to it; and the Temple of Concord and the Temple of Vespasian behind it. 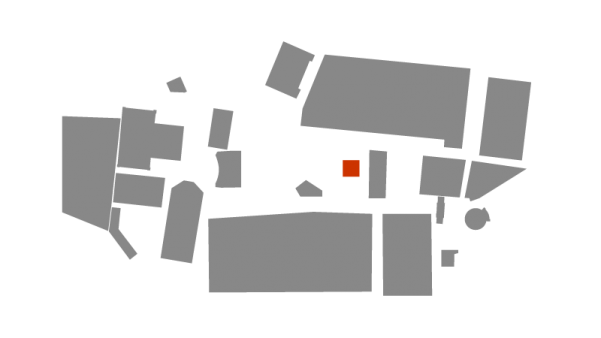 This description has supporting evidence in the form of a massive piece of the foundation that is composed of opus caementicium and situated at the middle of the open Forum area, which was newly paved. The latter indicates that a monument was taken down at that location in antiquity. In the early 20th century the equus Domitiani was believed to have stood slightly south of this position – this assessment was based on foundational remains which are still visible at the present day. However, the dating of the southern and northern foundational remains make it more probable that the former was the original location of the equus Domitiani. At the moment the southern foundational remains are believed to be belong to the Augustan Columnae rostratae, which were moved when Domitian’s monument was erected there. The only thing that has survived from the equestrian statue is its foundation (this is a matter of likelihood, not certainty; see above). 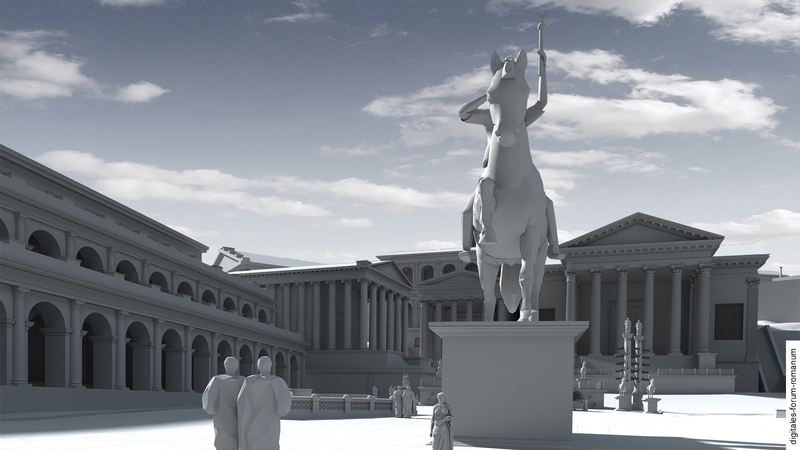 The area that the statue occupied was about 8 x 12 m, which reveals that the scale of the equestrian statue was massive (much more than life-size). One can estimate its height between 12 – 16 m (in our model we have opted for a height of 13 m). 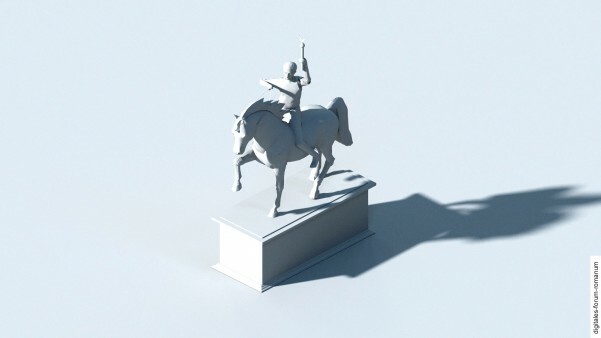 This is in accordance with the detailed description of the statue that was given by the poet Statius (silvae 1,1): He also emphasises the colossal scale of the equestrian statue – although his data should not be taken literally due to the panegyric undertone of his poem. On the basis of Statius’ description we have tried to reconstruct the statue’s appearance: Domitian is displayed with his majestic habitus, riding on a horse with his right arm raised and holding a small statue of Minerva in his left arm, while his horse places one of its front hoofs on the personified Rhine (who is bound), symbolising the subjugation of the Rhine and Germania. Coins dating from 95/96 A.D also show the Emperor on his horse with a similar iconography, which is why these images are sometimes taken to depict the equestrian statue on the Forum. J. Bergemann, Römische Reiterstatuen. Ehrendenkmäler im öffentlichen Bereich (Mainz 1990) 164-166. F. Coarelli, Il Foro Romano II. Periodo repubblicano e augusteo (Rom 1985) 211-217. F. Coarelli, I Flavi e Roma, in: F. Coarelli (Hrsg. ), Divus Vespasianus. Il bimillenario dei Flavi (Rom 2009) 81-83. C.F. Giuliani, Equus, Domitianus, in: E.M. Steinby (Hrsg. ), Lexicon Topographicum Urbis Romae II (Rom 1995) 228-229. C.F. Giuliani – P. Verduchi, L‛area centrale del foro Romano (Florenz 1987) 118-122. H. Knell, Bauprogramme römischer Kaiser (Mainz 2004) 146-147. S. Muth, Auftritt auf einer bedeutungsschweren Bühne: Wie sich die Flavier im öffentlichen Zentrum der Stadt Rom inszenieren, in: Ch. Reiz – N. Kramer (Hrsg. ), Tradition und Erneuerung. Mediale Strategien in der Zeit der Flavier (Berlin – New York 2010) 485-496 (490-493). S. Muth, Historische Dimensionen des gebauten Raumes: Das Forum Romanum als Fallbeispiel, in: O. Dally – T. Hölscher – S. Muth – R. Schneider (Hrsg. ), Medien der Geschichte – Antikes Griechenland und Rom (Berlin – New York 2014) 285-329. U. Schmitzer, Dichtung und Propaganda im 1. Jahrhundert n.Chr., in: G. Weber – M. Zimmermann (Hrsg. ), Propaganda – Selbstdarstellung – Repräsentation im römischen Kaiserreich des 1. Jahrhunderts n.Chr. (Stuttgart 2003) 222-224. P. Zanker, Forum Romanum. Die Neugestaltung durch Augustus (Tübingen 1972) 26-27.